The affected area will be Soi Thida in Kathu from 9am Thursday (Feb 7). 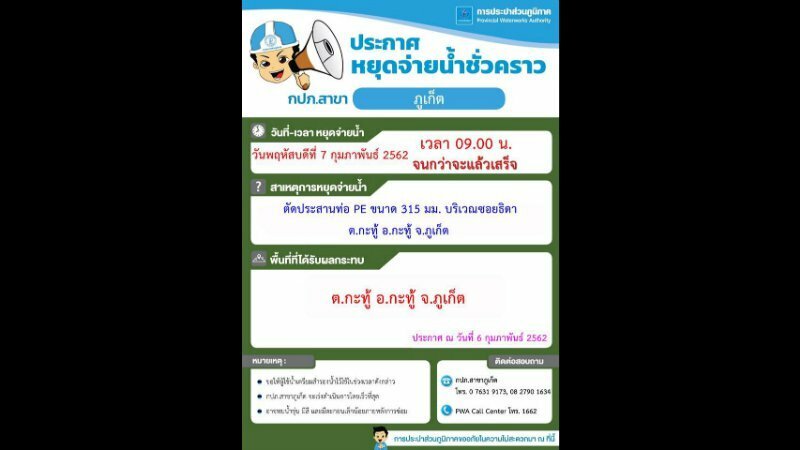 PHUKET:-- The Phuket Provincial Waterworks Authority (PWA) has announced that the mains water supply will be shut-off in parts of Kathu tomorrow (Feb 7). The mains water supply will be shut off from 9am until works are completed on mains supply pipes on Soi Thida in Kathu. “Please collect any water you may require beforehand. It is expected that the water may have some discolouration after the repairs a made. We will complete the works as soon as possible. We apologise for any inconvenience caused,” the PWA statement said.